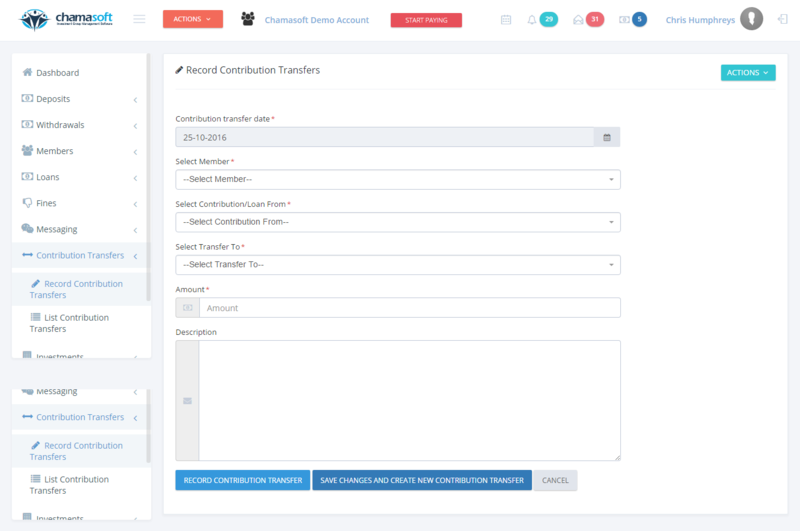 Chamasoft allows you to transfer a members contribution. This involves transferring of a a contribution from one member’s account to another within the group. When a member wishes to repay a loan through his/her contributions. When a member wishes to make a certain contribution through his/her other contribution. When a member wishes to make a payment (e.g. fine or other miscellaneous payment ) using his/her contribution. To record a contribution transfer, follow the steps below. 2. Enter the date, the member (making the transfer), the source of the contribution, the recipient contribution, the amount and a description (optional). click on RECORD CONTRIBUTION TRANSFER to save.